It is currently Sunday afternoon and I am sitting as close to the sun as possible while working on lesson plans for the week. I've been looking for the most efficient lesson planning strategy and have found for me just paper and pencil work the best. I've tried planbook.edu and a couple other lesson plans sites but haven't found one that allows you to structure lessons the way I like them. I'd love to hear how everyone else plans lessons. 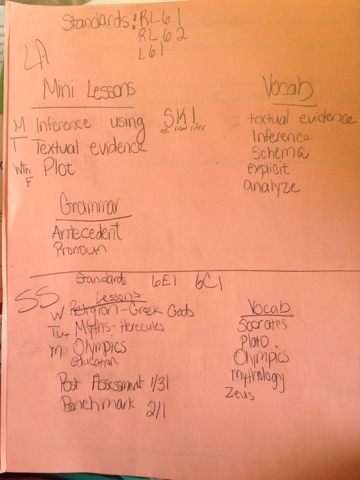 The best way I have found is to create a little map on paper that outlines the standards I want to teach that week along with the topics and vocabulary I want to cover. Then I go back and write down what day I want to teach them on. After I know what topics I want to teach then I go through my resources and lay out everything I want to use in order. The last thing I do is actually write up the lesson plans onto a template to turn in to my principal.